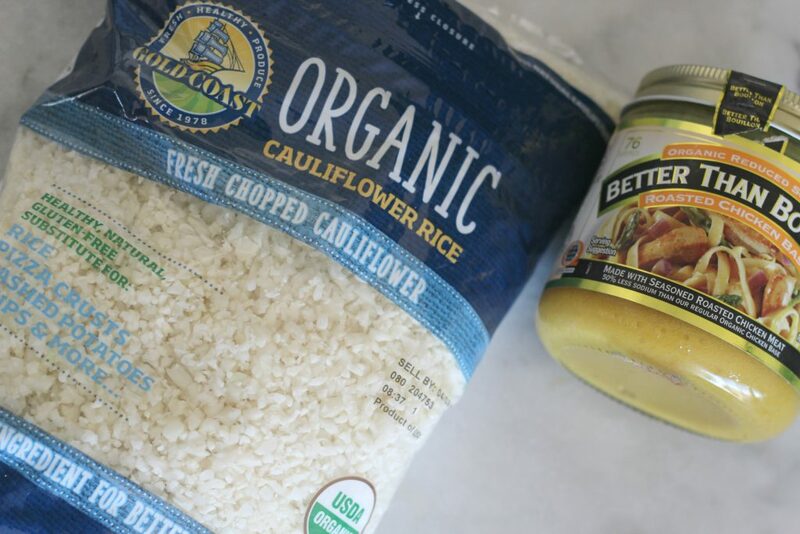 Make your low carb sides amazing every time with this recipe for perfect pressure cooker cauliflower rice! I might be the only one here with this problem, but I have royally screwed up cooking cauliflower rice more than once. It usually has to do with over cooking and turning to mush or being too wet. 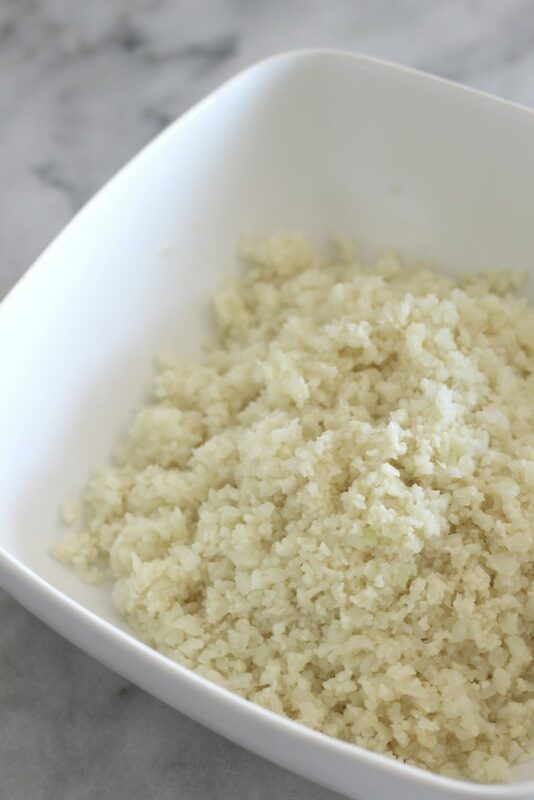 I want my cauliflower rice to look and feel like rice…soft and fluffy. I finally found the answer to my problem, the Instant Pot. Yep, that oversized lug of a gadget that I am slowly embracing. I already professed my love of using it to make shredded chicken for my weekly meal prep. 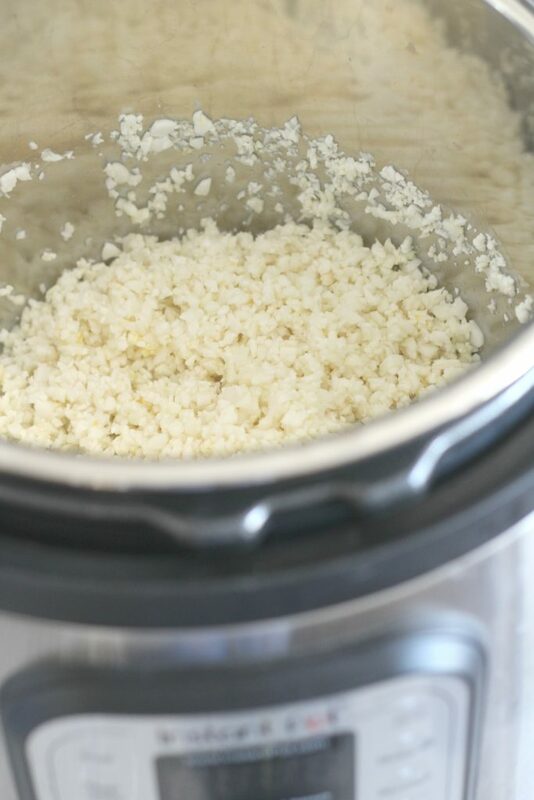 Using the pressure cooker for the cauliflower rice has been…dare I say it…a game changer. We eat cauliflower rice multiple times a week, and I kind of disliked standing over the stove, stirring it and waiting. I mean it’s hard to make healthy meals day in and day out when you have a toddler, two kids in multiple after school activities and what not, so I will take any short cuts I can get. And this presure cooker cauliflower rice is just that. All you need for this is one cup of liquid and approximately 18 ounces of riced cauliflower. I get 32 ounce bags of riced cauliflower at Costco, in addition to frozen bags. I prefer the fresh to frozen, but the fresh doesn’t last long at all. Of course I could rice my own in a food processor or just using a grater, but we’re going for convenience here folks! 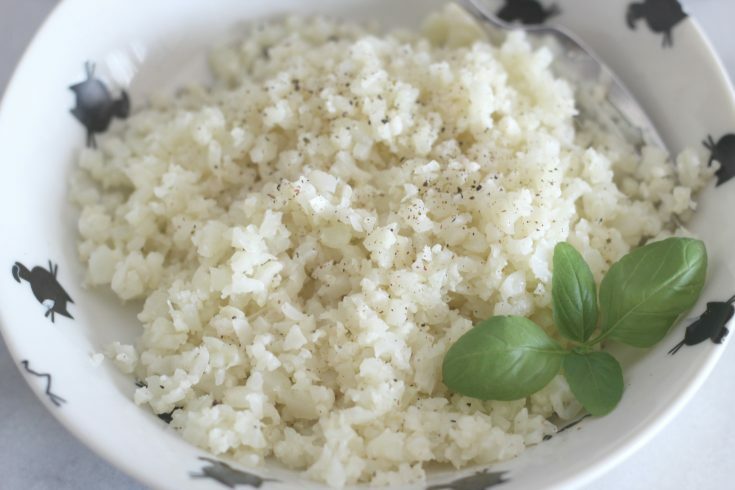 Plus, have you riced cauliflower with a grater? Cauliflower gets everywhere. And I’m a messy cook to start with, so it’s just not good. Put your riced cauliflower in the pressure cooker, add your liquid and stir. You can add salt or seasonings if you’d like. I use chicken stock typically, which adds a ton of flavor. After stirring, secure the lid. Press manual. The pressure level should default to high pressure, but double check to make sure. Set it to cook for one minute. One whole minute. Once the pressure cooker gets to pressure, typically 8 minutes for me, then cooks for 1 minute, it’ll beep. At this point do a quick release to let out the pressure. Then your done! If for some reason there is a little excess liquid in your cauliflower rice, just drain it. It happens from time to time, but doesn’t change the texture of the rice. 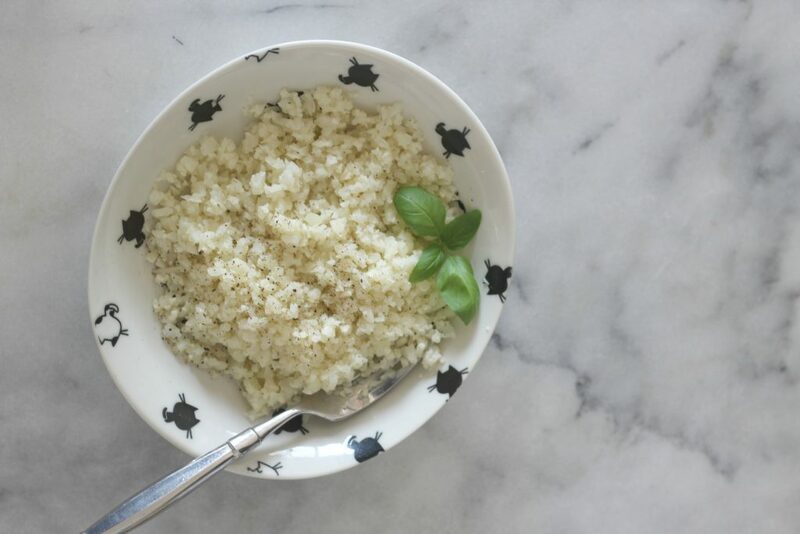 What will you put on your pressure cooker cauliflower rice? How about this Cheesy Cheddar Cauliflower Rice!! Nutrition calculated with cauliflower rice cooked with water. It so easy! 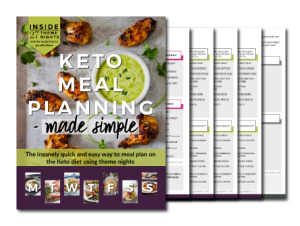 I love it – Thanks for sharing at the What’s for Dinner party! I didn’t realize that rice cauliflower was sold in bags. Will have to give this a try and see if it can possibly replace the rice we eat almost daily. I haven’t purchased an instant pot/ pressure cooker yet. Still on the fence about it. Pinned and sharing. Thanks for sharing at the inspiration spotlight party @DearCreatives See you again soon. 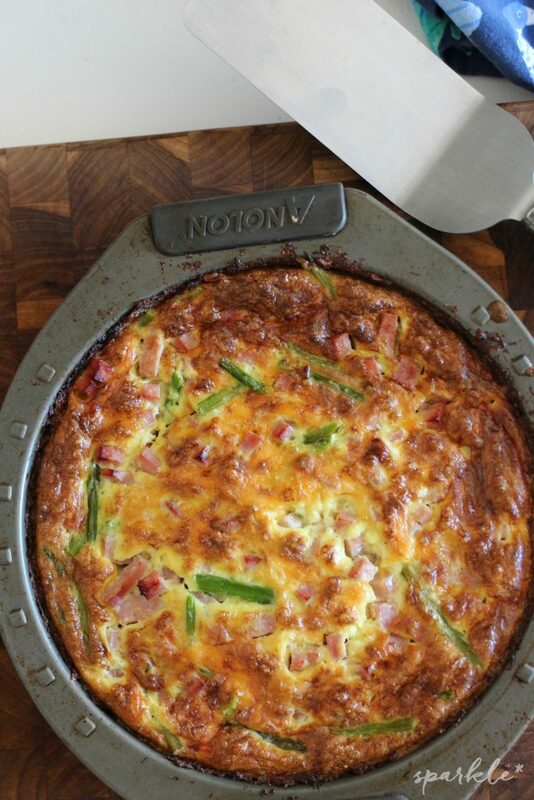 Your post is featured on Full Plate Thursday this week and it will be pinned to our Features Board. Thanks so much for sharing with us and enjoy your new Red Plate! I love the cauliflower rice at Costco. We eat it all the time. I will be trying this for sure. Anything to simplify dinner is a great help. That’s fantastic! My Costco stopped selling the fresh cauliflower rice. Now I just use my cheese grater to grate make it. It’s a pain, but I don’t love the frozen stuff so much. If I need to make enough of this for a large group, should I make it in 2 batches? And then can I put it all back in the IP on keep warm and it will make it a little while? I haven’t tried doubling the recipe, but it might work just fine. But to be on the safe side, I would do two batches.